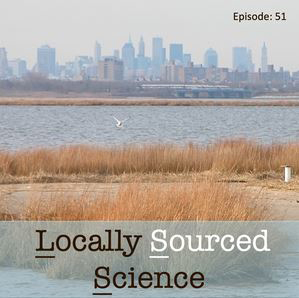 Brooklyn, NY, January 10, 2019 - In the latest 30-minute "Locally Sourced Science" podcast, the host explores how natural systems can coincide with people. Joining in the discussion is New York Sea Grant's Coastal Resilience Specialist Helen Cheng, whose position is supported through a partnership with the Science and Resilience Institute @ Jamaica Bay. The outreach program that Cheng heads up, which is detailed online at nyseagrant.org/jamaicabay and http://srijb.org, focuses on community engagement and research efforts to enhance resilience for the communities within the Jamaica Bay Watershed. Cheng, who enters the discussion in the above audio clip around the 6:20 minute mark and continues through around 21:54, talks about her role in connecting professors at Cornell University to people in New York City's coastal communities and the significance of her work during her two plus year tenure. Her discussion with Locally Sourced Science was recorded during a visit to Cornell's Ithaca campus. "How I define myself as coastal resilience specialist is really connecting [people to] science and making science usable for coastal communities," says Cheng. “Locally Sourced Science,” which airs at 5 pm every other Sunday on WRFI (88.1 FM Ithaca, 91.9 FM Watkins Glen), presents science explorations and events happening in the Finger Lakes Region. We feature interviews with local scientists, news updates about recent discoveries and a calendar of science events in the region. Volunteers who are scientists and science journalists produce our show. Learn more at www.locallysourcedscience.org; Listen to the podcast at www.mixcloud.com/Locally_Sourced_Science; Check them out on twitter at www.twitter.com/FLXScienceRadio. The Science and Resilience Institute @ Jamaica Bay (SRIJB) is a research center focused on enhancing environmental, social, and economic resilience in communities of Jamaica Bay funded by the Rockefeller Foundation and the City of New York.